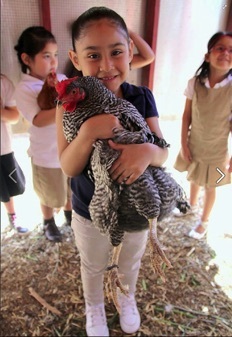 Part 1: Walking on to the Manzo Elementary School campus located in Tucson, Arizona's west side is like entering a full functioning hobby farm. 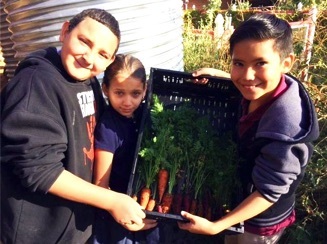 Students can be seen picking cilantro and carrots from their outdoor school garden, herding (or often carrying) chickens back into their coop, greeting their giant desert tortoise or planting seeds into grow cubes for their next Aquaponics STEM Food Growing System crop. Sitting right in the middle of all the hustle and bustle of this school’s amazing Ecology Program is the Manzo Greenhouse and inside is a 44 sq. ft. Aquaponics STEM Food Growing System with its accompanying 320 gallon fish tank. 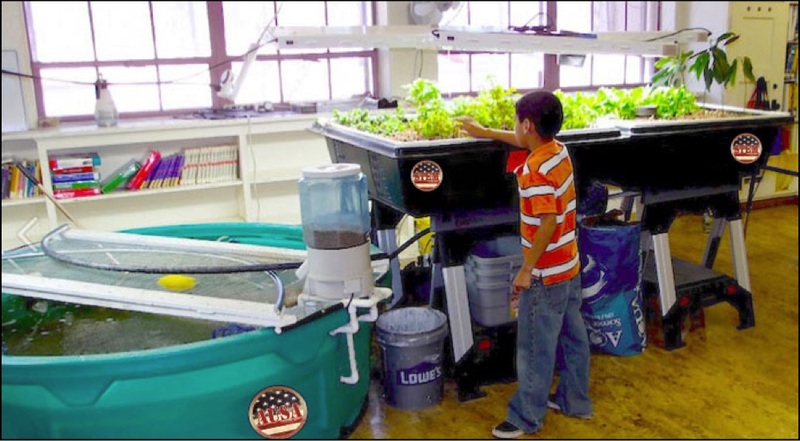 This school was an early adopter of Aquaponics STEM Food Growing Systems and started their Aquaponics program in late 2011 when Aquaponics USA installed their STEM system into a Music Room during the Christmas break that year. Aquaponics is a food growing technology that utilizes live fish to fertilize vegetables and fruits in a cross-linked ecosystem where the fish fertilize the plants and the plants clean the water for the fish. STEM Food Growing Systems integrate Plant and Fish Biology with Chemistry, Math and Engineering. It's STEM Education that actually deals with stems. Here is the original STEM Food Growing System that was installed in the Manzo Music Room. There are two more Grow Beds on the other side of the 320 gallon fish tank. Sitting on top of the tank is the Automatic Fish Feeder, which allows Teachers to leave their Aquaponics STEM Classrooms for the weekend or holidays without worrying about feeding the fish. This System was moved to the Greenhouse. 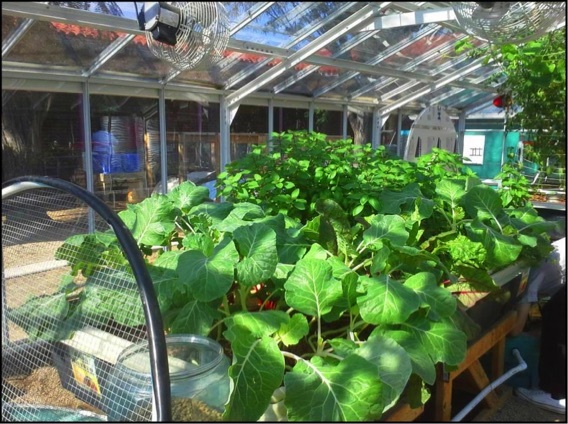 Once their Aquaponics STEM Food Growing System was installed in the Greenhouse with all of that natural light, they could grow flowering plants along with leafy greens. Indoor systems using Fluorescent Grow Lights like the ones pictured above can only grow leafy greens. But now Schools can order our new LED Grow Lights for indoor growing that put out the kind of light spectrum that allows for the growing of both leafy greens and flowering plants like tomatoes, squash, melons, peppers and much more right inside of Classrooms, Multi-purpose rooms and even Libraries as you’ll see in Part 2. 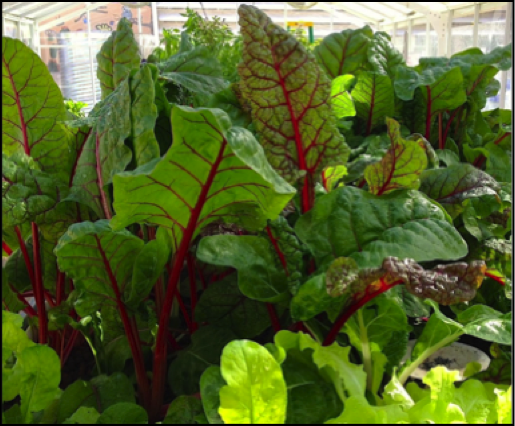 Pictured next to this photo of the Manzo Greenhouse is a Grow Bed full of Swiss Chard and Arugula. 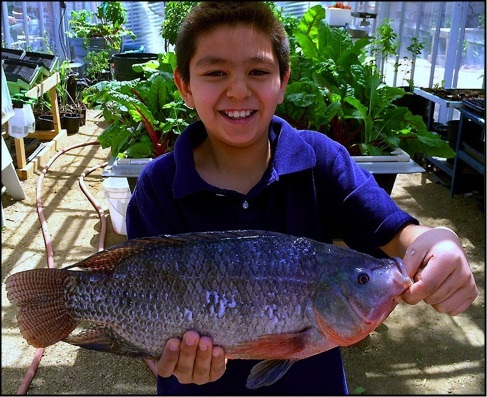 In order to grow these incredibly healthy vegetables, students need to learn to monitor their Aquaponics STEM Food Growing System, which means maintaining the balance between the fish in the fish tank and the vegetables in the Grow Beds. 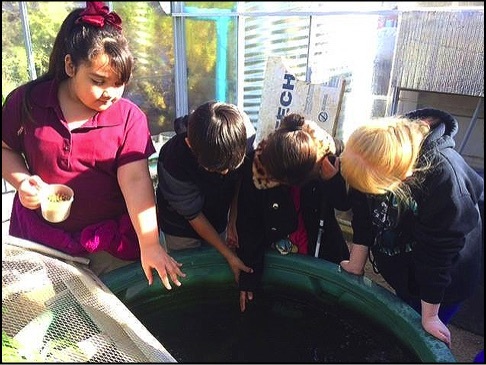 Therefore, the Manzo Elementary students learn to perform water quality measurements on their STEM System and, in so doing, they learn elementary chemistry concepts along with the Nitrogen Cycle, and they practice reading water temperature thermometers. 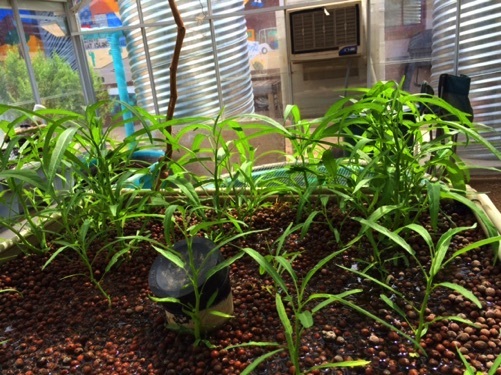 Above are two unusual plants that are growing like weeds (there aren’t any actual weeds in Aquaponics systems) in Manzo’s STEM Food Growing System. The first one is called Portuguese Kale, and it was chosen because it grows well in hot temperatures like Tucson experiences during the summer. The second one is called Chinese Water Spinach also known as Morning Glory. It’s used in specialty duck and shrimp dishes in Thai cooking, and it can’t be sourced anywhere locally by the Senae Thai Bistro in downtown Tucson. 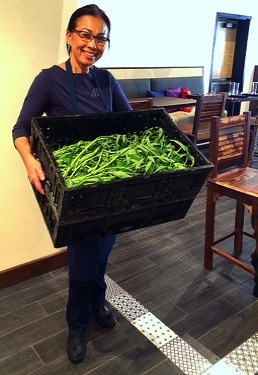 Pictured above is the happy face of Dee, the Thai Bistro owner, after she receives her bi-monthly delivery of Chinese Water Spinach and Thai basil from Manzo’s Stem Food Growing System. The red pebbles you see in the Grow Beds above are expanded clay Grow Bed Media. Aquaponics does not use soil for growing food because it’s main source of nutrients comes from the water that is recycled back and forth from the fish tank to the Grow Beds.The expanded clay holds the plants in place in what are called Deep Media Grow Beds (one type of Grow Bed that is used in Aquaponics) and it functions as a place for the friendly bacteria to grow and thrive. Aquaponics actually grows three things--fish, vegetables, fruits and friendly bacteria that break down the fish waste and turn it into nitrates that the plants use as fertilizer. That’s where the Nitrogen Cycle comes into play and why it’s important for students to learn about it. What Blue is coordinating at Manzo is quite literally a magical wonderland of plants, fish and animals all interacting with excited, engaged and amazed children. This is STEM Teaching at its best. 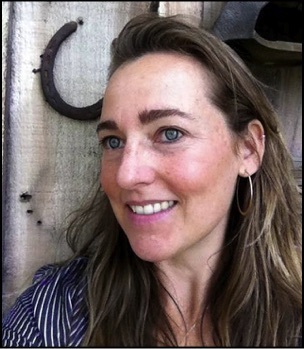 Blue did her undergraduate studies at Colorado College and later completed her MPH (Masters in Public Health) degree at the University of Arizona. Before Blue took charge of the Manzo Ecology Program in the fall of 2014, there was Moses Thompson, above and on the rightt. He was there in 2011 when the STEM Food Growing System was installed in the Music Room. This picture shows the Manzo installation crew putting the expanded clay into the Grow Beds. Moses took the bull by the horns, so to speak, and really ran with the Manzo Aquaponics STEM System. 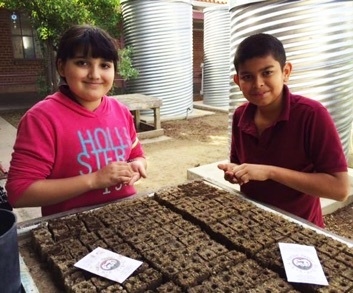 In 2013, the Greenhouse was built and in late 2014, Blue came on board and later Moses was promoted to head the entire School Gardening Program for the Tucson Unified School District. With Coordinators and Instructors like Blue and Moses, any Aquaponics STEM Program would be a huge success turning Science into hands-on interactive learning at its best. Then there’s the fish, which are an important part of STEM Food Growing Systems. 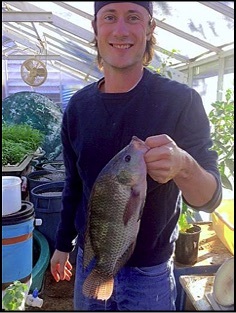 The fish are so important that Aquaponics USA calls the fish tank “the engine of the Aquaponics System”. And what a bunch of whoppers are being grown in Manzo’s 320 gallon fish tank! Tilapia are one of the easiest fish to grow because they are very hardy and can withstand beginner water quality errors. According to Blue, the “tilapia are harvested when they reach approximately two pounds” at which point “they are sold at the ‘Manzo Market’ ”. They “always sell out immediately, even with a one-per-customer limit!” Raising tilapia really isn’t difficult as long as their water quality is good, so students need to take frequent water quality measurements. The fish tank may be one of the most fascinating places on the Manzo campus. Everything fish do goes on inside that fish tank. They eat, they breed, they brood their young and eventually they are caught and sold at the “Manzo Market” or are eaten at a Manzo Fish Fry. Tilapia are so resilient they can even survive for several hours without the aerators that keep oxygen flowing in their tanks. Yes, fish need oxygen and cannot survive without it. 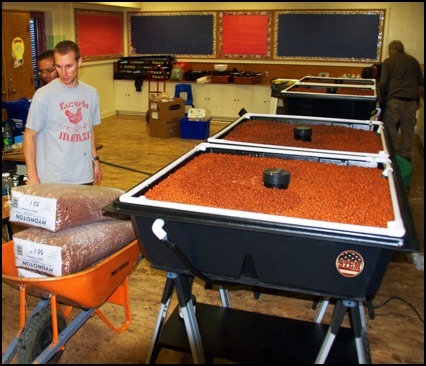 The title of this Series, “We send Schools of Fish to Schools!” is all about the bundled STEM Food Growing Systems we send to schools, which include 25 fingerling tilapia, the Grow Bed Media, the automatic fish feeder, a Titanium Heater, a Seed Starter Kit and optional Grow Lights. This is Joe Navelski, a Peace Corps Coverdell Fellows Program superstar, who showed up to catch and clean Tilapia for the “Manzo Market”. The fish are caught in the morning, and put on sale in the afternoon. That’s really fresh fish. No wonder they always sell out. 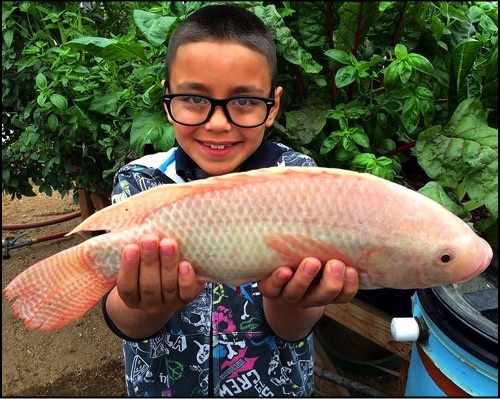 According to Blue, “in addition to providing food for our community and serving as a source of revenue, the Aquaponics system at Manzo is a great teaching tool, even at the Elementary level. Students learn Math, Science, Biology, Chemistry and even best Business Practices as they operate and maintain their system and host a weekly market where they sell the veggies and fish that they grow.” Not to mention, their wholesale business with the Thai restaurant. Below, students examine the seedlings they are growing in the Greenhouse with their magnifying glasses. 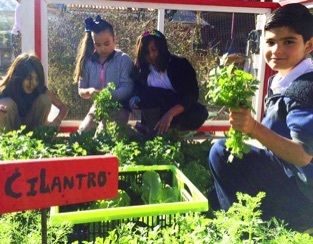 Isn’t it time to turn every school campus into this joyful, exciting, engaged and interactive experience called STEM Food Growing System Learning? 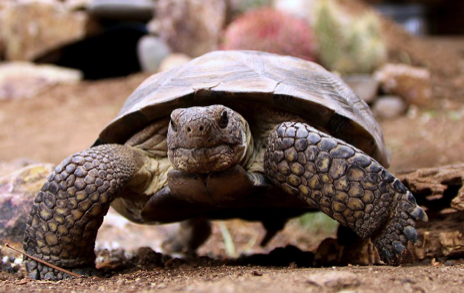 If you want to learn more about what's happening at Manzo, go to the Manzo Ecology facebook page. This is living learning also known as Science in Action and things are always changing. This is the 320 gallon fish tank that comes with the 44 sq. ft. STEM Food Growing System. Here Moses is looking for fry, which are newborn tilapia that turn into the giants you see below. Because there's so much light coming into the Greenhouse, Manzo is running what is called a Green Water Fish Tank that has a lot of algae, which tilapia love to eat and why they're growing so large. What Is Aquaponics? Aquaponics is a food growing technolgy that utilizes live fish to fertilize vegetables and fruits in a cross-linked ecosystem where the fish fertilize the plants and the plants clean the water for the fish. 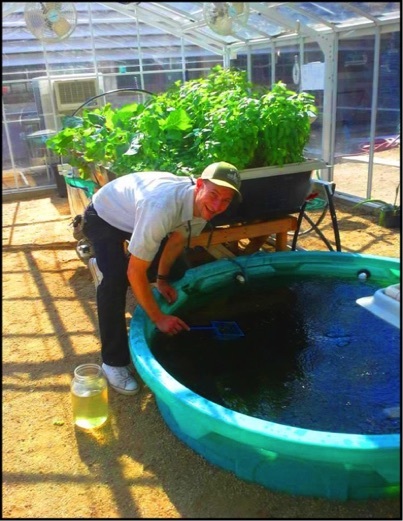 Here's what Aquaponics STEM Teachers have to share direct from the field where they are using our STEM Food Growing Systesm to teach their Aquaponics STEM Classes. This is a 3-Part Series that's being published in the STEM Education Coalition Weekly Newsletter. The STEM Education Coalition Newsletter is an amazing resource to keep you up to date about what's happening with STEM in schools across the nation and in State and Government administrations and agencies. 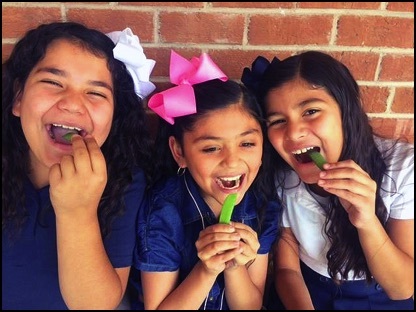 And here’s an amazing sight to behold, children gleefully eating their vegetables! That’s what can happen when they grow the vegetables themselves in their STEM Food Growing System. 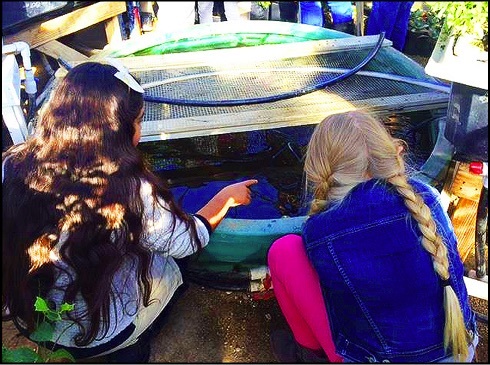 Click here for Aquaponics STEM in the Classroom Part Two. 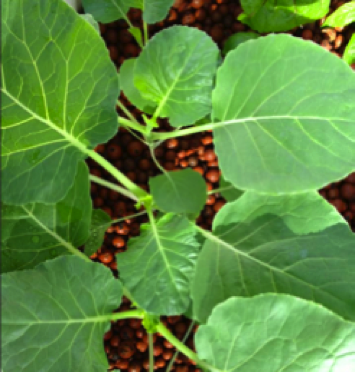 Click here for Aquaponics STEM in the Classroom Part Three. 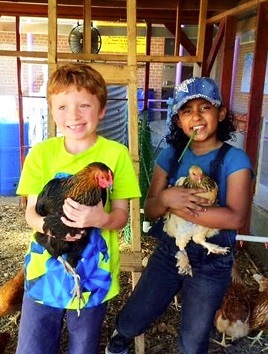 To Learn More about bringing a STEM Food Growing System into your classroom, click on our "Bring Your Classroom To Life!" document below. 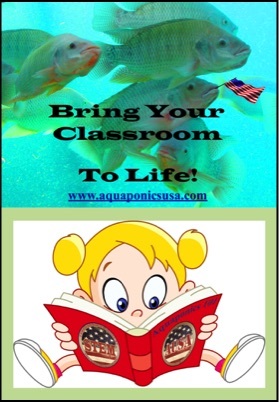 It will tell and show you everything you need to know to create an Aquaponics STEM classroom.